CARA is a national leader in the study of Catholic media use. CARA regularly includes questions regarding media use in its CARA Catholic Polls (CCP) series and has conducted studies specifically focused on media use including surveys and analysis of other national data sources. At a diocesan level CARA designs surveys to be completed by readers of diocesan newspapers, priests in the diocese, and other diocesan personnel. CARA can assist in the analysis of subscription trends over-time and map subscription areas. Using survey research and/or focus groups CARA can collect information about readers and subscribers as well as their attitudes and preferences for a publication. This research collects readers’ evaluations of the paper, reading habits, interest in stories, topics, and format, as well as religious behavior, demographics, other media use, and consumer behavior. It is often used to make decisions about content and format as well as produce the information needed to attract potential advertisers. CARA can provide comparisons between readers, diocesan newspaper readers nationally, adult Catholics nationally, and/or the general U.S. adult population. CARA also conducts research for Catholic publishers. We utilize surveys, focus groups, and interviews to understand reader’s and educator’s interests in and satisfaction with material. These studies are typically custom designed to evaluate a product in development or already out in the marketplace. We help publishers understand their markets and refine their products from religious education textbooks to online media. For further information about Catholic newspaper and media research, contact Mark M. Gray, Ph.D. by phone (202-687-0885), or by email. This report represents findings from a national poll of adult self-identified Catholics regarding their use of new media. From video games to YouTube the study explores Catholics use of digital and online media. The study identifies parish websites as being the most often visited Catholic-oriented site by Catholics. The adult Catholic population is nearly evenly divided by those aware of the Church’s presence online and those who are not aware of this. This report represents findings from a national poll of adult self-identified Catholics regarding their use of traditional and new media. It measures their preferences for content online and in print. Twenty-six percent of adult Catholics say they have read a print copy of their diocesan newspaper or magazine in three months prior to being surveyed. A majority of weekly Mass attenders (55 percent) report readership of a print copy of this in the last three months. 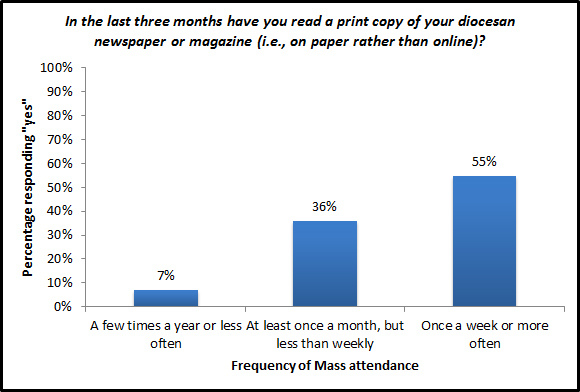 Although open to digital copies of diocesan news publications, respondents still indicate preferences for print copies. months prior to being surveyed. 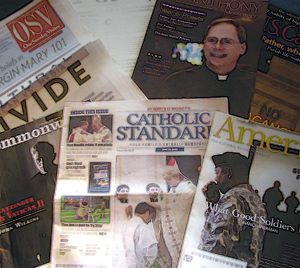 The report documents awareness and readership of specific national Catholic publications.